Summary: This article explains the benefits of using remote BNC switch box or multiplexer in the industrial or production line applications. A practical example with C pseudo code is included in this article. Design of automated electronic measurement system can be a complicated task. Modern hardware test stands or test environments require fast and reliable measurements at high number of test points. Today’s electronic prototype systems can have more than 100 inspection test points. Often designers make manual measurements in most critical system points but this does not guarantee complete test coverage. Another approach is to use automated test systems where measurements are made via remote PC executing test script. The disadvantage of such systems is a need to allocate one measurement instrument to each test point resulting in overall high system cost. 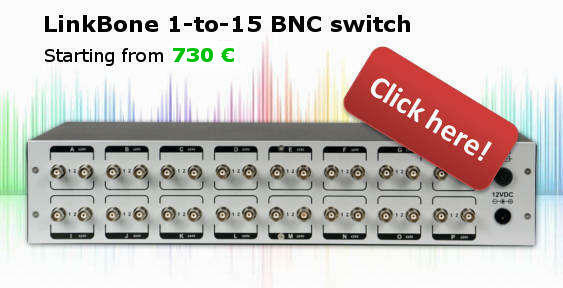 To avoid such a situation remotely controlled BNC switch or BNC multiplexer box can be used. Figure 1 shows an example system. The main measurement instrument is connected to the common output of the multiplexer switch. The Device Under Test (DUT) measurement points are connected to the inputs of the multiplexer. Control of the measurement instruments and switch is done via remote PC executing test procedure. LinkBone - to make measurement and test automation easy.